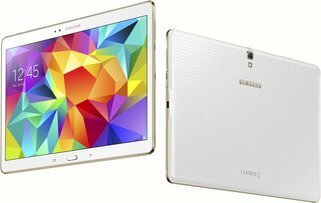 Samsung Galaxy Tab S 10.5 is a high quality Android device launched some years ago, in 2014, which counts with a good performance Octa-Core processor (formed by a Quad-Core running at 1900 megahertz and an extra Quad-Core running at 1.3 gigahertz), an enormous 10.5-inches multi touch screen, an 8 megapixels back facing camera and a 2.1 MP front camera. The Samsung Galaxy Tab S 10.5 ships with a Exynos 5 Octa 5420 chip, which holds a fast Octa-Core processing unit (actually, there is a Quad-Core running at 1.9 gigahertz and an extra Quad-Core clocking at 1.3 gigahertz) with a huge 3 GB RAM. A good aspect of the Tab S 10.5 is its 16 GB quite big internal memory and an external SD slot, allowing you to store hundreds of apps without running out of space. The Tab S 10.5 feels much lighter than what one would think about a tablet like this. The Tab S 10.5 has a beautiful design, with a thickness of just 0.26 inches. This tablet is a compact tablet, taking into account that it has a 10.5" display and it's only 9.74 inches long and 6.98" wide. This tablet is offerred in two color options, black and white. This tablet has a nice 1600 x 2560 10.5-inches display, which makes it hard to see the pixels taking part of the display. This display uses Super AMOLED capacitive technology, and allows multi-touch gestures. The Samsung Galaxy Tab S 10.5 has two cameras, an 8 MP back side camera and a 2.1 MP front-facing camera. It can also capture Full HD 1920x1080 videos at 30 fps. This camera also counts with lots of great characteristics: flash, auto-focus, fast burst mode, digital image stabilization, geo tagging and HDR mode. The Tab S 10.5 packs a large 7900 mAh battery that can keep it running for several hours and even reach the end of the day without charging it. This tablet has WiFi capability (which it can share with other devices acting as a mobile hotspot) or 4G (LTE) fast connection type. The Tab S 10.5 uses a Micro SIM card for GSM services. This tablet also includes many interesting features like Bluetooth, Fingerprint ID, GPS Localization and Near Field Communication (NFC), and multiple sensors like Light Sensor, Accelerometer, Gyroscope and Compass. Samsung is selling the Tab S 10.5 for 800 dollars, which is quite a high price for comparing with similar devices. It doesn't matter whether you want it for gaming, are looking for a social tablet, love photography or are looking for a tablet for work, this tablet is definitely a good choice for you.